BURTON, JOHN, Methodist and Baptist minister; b. July 1760 in County Durham, England; m. Mary – also of England, and they had one son and one daughter; d. 6 Feb. 1838 in Halifax. 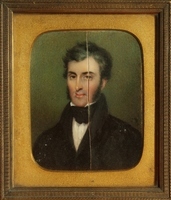 John Burton and his family came to Halifax on 20 May 1792 while on their way to the United States. Burton had been sent to the new republic as a Methodist missionary under the auspices of the Countess of Huntingdon, a wealthy benefactress of the Methodist cause. Upon his arrival in Halifax, he was invited to fill the pulpit of Philip Marchinton*’s meeting-house. He preached there until the fall of 1793, when he made a trip to the United States. While he was in Knowlton, N.J., he embraced Baptist principles, received baptism by immersion, and was ordained a Baptist minister in January 1794. He returned to Nova Scotia that June, having apparently abandoned his original plan of settling in the United States. In 1794 Burton seems to have been the only Baptist in Halifax. By 1795, however, his preaching had won enough converts that a church could be formed. In 1802 the tiny congregation moved into its new chapel at the corner of Barrington and Buckingham streets. The chapel had been built with funds which Burton had raised during a visit to Baptist congregations in New England. Modelled on the Regular Baptist order, Burton’s church adhered to the Philadelphia Confession of Faith, a strict Calvinist creed. Among other things this creed restricted communion to those who had been baptized by immersion. The tiny church was the only Baptist church in the colony which kept to the letter of strict Baptist doctrine and practice. All the other churches in the Nova Scotia Baptist Association (formed in 1800) admitted unimmersed members. Because of his principles, Burton kept his congregation outside the Baptist association until 1811, two years after that body had finally adopted the Regular Baptist order. Still, although not in their association for many years, Burton was sought out by the Baptists to give advice and counsel on matters of doctrine and structure. In fact, so highly esteemed was he that the year after his church joined the association Burton was made its moderator. In the early 19th century Burton was one of a group of preachers – his colleagues included Joseph Dimock, Edward Manning*, Harris Harding*, and Richard Preston* – who contributed to the dramatic growth of the Baptist church in Nova Scotia. As well, in his work among the colony’s black Baptists, Burton helped fill the void created by the departure of David George*, a black preacher who had joined the exodus to Sierra Leone in 1792. Indeed, Burton should be seen as a bridge between George in the late 18th century and Richard Preston in the 1820s, for during that long period he was the only preacher who made the religious welfare of Nova Scotia’s black Baptists one of his chief concerns. In 1811 Burton’s church had 33 members, the majority of whom were free blacks from Halifax and the neighbouring settlements of Preston and Hammonds Plains. Shunned, or merely tolerated, by the rest of Christian Halifax, the blacks were from the first warmly received in the Baptist Church. Burton became known as “an apostle to the coloured people” and would often be sent out by the Baptist association on missionary visits to the black communities surrounding Halifax. He shared the extreme poverty of his congregation, and yet he was frequently seen going out to these black communities with goods and bread for the poor. During and immediately after the War of 1812, roughly 2,000 black refugees left the southern United States under British protection to settle in Nova Scotia [see Thomas Nickleson Jeffery]. Recognizing Burton’s familiarity with the black community, the Nova Scotia government made him one of those in charge of the refugee settlements in Hammonds Plains and Preston, even giving him the power of magistrate to settle legal matters. Since the dislocated blacks had to contend with the smallpox epidemic of 1815, as well as with all the problems of learning to live in a new land, Burton’s commission was a staggering one. By 1819, because of Burton’s work among the refugees and because most of these blacks had been Baptists in the United States, the Halifax church had swelled to a membership of 300 – more than double the size of the next largest congregation in the colonial Baptist association. Throughout this period Burton trained both black and white elders to work with him in his church and among the colony’s growing black population. These elders were sent out on lengthy preaching missions which saw the formation of new black Baptist churches throughout Nova Scotia. Richard Preston was one such travelling elder. In 1824–25 a controversy at St Paul’s (Anglican) Church [see John Thomas Twining*] caused several members of that communion to leave and adopt the principles of the Baptist faith. These whites, who included James Walton Nutting*, James William Johnston*, and Edmund Albern Crawley*, were not anxious to join with the Halifax Baptist Church because of its congregation’s low social status and what they judged to be Burton’s insufficient education. After worshipping briefly at Burton’s church, the new Baptists formed their own congregation in a chapel on Granville Street. This chapel became known as the First Baptist Church after the dissolution of Burton’s church, and it bears that name today. Burton’s Halifax church was plagued by other dissensions; power struggles and racial tension were especially divisive. Finally, in 1832, under Richard Preston, 29 members left Burton’s church to form the African Chapel, located on Cornwallis Street. In only a few years this church would become the focal point of black evangelism and ministry for the entire colony. The original Baptist church of Halifax grew smaller, and Burton’s age and declining health made it impossible for him to minister regularly to it. After his death in 1838 its membership was completely absorbed in the two newer Baptist churches of Halifax. Burton made a great impact upon the white Baptist church of Nova Scotia, and was the major influence on the structure and growth of its black Baptist church. His counsel helped to lead to the adoption of New England Baptist principles which gave Nova Scotia’s white Baptists a unity in doctrine and structure. Within his own lifetime he was recognized as “a Father of the Baptist Denomination in Nova Scotia.” His labours in Halifax initiated the growth of black congregations throughout the province. Among the blacks, it was he who was responsible for the training of the early black elders and the strict adherence to Baptist structural models. These twin contributions were the foundations for all subsequent development and growth in the black Baptist church of Nova Scotia. 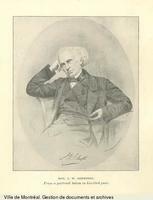 A portrait of John Burton is in the Atlantic Baptist Hist. Coll. at Acadia Univ. (Wolfville, N.S.). His bible (London, 1708) is at St Paul’s Anglican Church in Halifax. Atlantic Baptist Hist. Coll., Joseph Dimock, diary; Edward Manning, corr. and journals, vols.2, 4–7; Menno [J. M. Cramp], “The Baptists of Nova Scotia (1760–1860)” (scrapbook of clippings of column by Cramp in the Christian Messenger, 18 Jan. 1860–23 Sept. 1863); “A sketch of the history of the Baptists in the city and county of Halifax” (typescript, [1897?]). PANS, MG 100, 115, no.15; RG 5, P, 42. David Benedict, A general history of the Baptist denomination in America and other parts of the world (New York, 1848). N.S. and N.B. Baptist Assoc., Minutes (Halifax; Saint John), 1811; 1818–19. N.S. Baptist Assoc., Minutes (Halifax), 1835. Acadian Recorder, 10 Feb. 1827. Christian Messenger, 16 Feb. 1838. Bill, Fifty years with Baptist ministers. J. M. Cramp, Baptist history: from the foundation of the Christian church to the close of the eighteenth century (Philadelphia, ). S. E. Davidson, “Leaders of the black Baptists of Nova Scotia, 1782–1832” (ba thesis, Acadia Univ., 1975). Levy, Baptists of the Maritime prov. P. E. McKerrow, A brief history of the coloured Baptists of Nova Scotia . . . (Halifax, 1895). A. P. [Borden] Oliver, A brief history of the colored Baptists of Nova Scotia, 1782–1953; in commemoration of centennial celebrations of the African United Baptist Association of Nova Scotia, Inc. ([Halifax, 1953]). Repent and believe: the Baptist experience in Maritime Canada, ed. B. M. Moody (Hantsport, N.S., 1980). R. W. Winks, The blacks in Canada: a history (London and New Haven, Conn., 1971). R. M. Hattie, “Old-time Halifax churches,” N.S. Hist. Soc., Coll., 26 (1945): 49–103 . Stephen Davidson, “BURTON, JOHN,” in Dictionary of Canadian Biography, vol. 7, University of Toronto/Université Laval, 2003–, accessed April 22, 2019, http://www.biographi.ca/en/bio/burton_john_7E.html.